Migraines headaches have various causes of which the exact origin for many patients is not precisely clear. This explains the lack of successful resolution for a large large number of people affected by this type of head pain. But there is one small group of migraine patients that do enjoy the benefits of improvement through surgical means. These patients have very specific foci (trigger points) for the origin of their headaches and have been identified to specific extracranial sensory nerves and vessels. For this group decompression of these trigger points has been consistently shown to reduce migraine severity and frequency. One rarely mentioned or reported trigger for migraine headaches is the large temporalis muscle. This is typically associated with bruxism or clenching with hypertrophy or hyperactivity of the muscle associated with mastication. While this is the most common type of temporal muscle dysfunction, I have seen a few patients who locate their migraine foci at the temporal muscle above the ears. Their migraines are significantly reduced by Botox injections into this posterior belly of the temporal muscle. This raises the possibility of treating their migraines with excision of the part of the muscle as I often do for aesthetic head narrowing purposes. 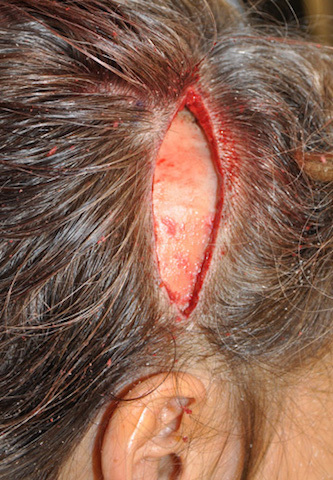 In a female with temporal muscle-based migraines, the question was whether complete temporal muscle removal would alleviate her symptoms. Given that she was female with a good head of hair, an ‘old style’ direct approach to the procedure was done. The entire posterior temporal muscle and fascia was excised down to the temporal bone surface. This produced a sustained reduction in her migraine symptoms at the 90% level. While posterior temporal reduction is typically associated as an aesthetic procedure to reduce the convexity at the side of the head above the ears, in rare cases it can also be an effective migraine surgical procedure. We know from the aesthetic experience that there are no adverse functional sequelae to removing this part of the temporalis muscle.